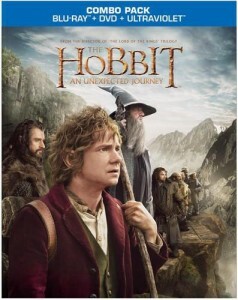 A fake DVD cover for Hobbit: An Unexpected Journey? A cover for the DVD and Blu-ray version of “The Hobbit: An Unexpected Journey,” has been making the rounds on the internet. The design, as you can see, features Martin Freeman as Bilbo Baggins as the most prominent figure with Gandalf and Thorin Oakenshield close behind. The other dwarves sneak into the image but not prominently. It is possible this image was leaked from the studios involved but it seems unlikely and this image isn’t a powerful “buy me” image from the movie. No word from any official channels has surfaced to say this is or isn’t fake so we advise not accepting it as the gospel truth at this point. If any excellent photoshopping readers out there want to produce some imagined blu-ray covers it would be fun to run a collection of them here, so if you have a submission send them over to Spymaster@TheOneRing.net. Dates for the initial offering are reported as March 19 with an Extended Edition in October but nothing official has been announced. The film will still be available in some theaters at that point. Date posted by retailers like Amazon are not reliable and have included books that haven’t been written yet previously. When official dates are released, you will find them reported here.